Based on work spanning a decade, this study of the Maquipucuna area on the western slopes of the Andes discusses the climate, vegetation, ecological relationships, and flora, and emphasizes the importance of the Maquipucuna area as a biological reserve. 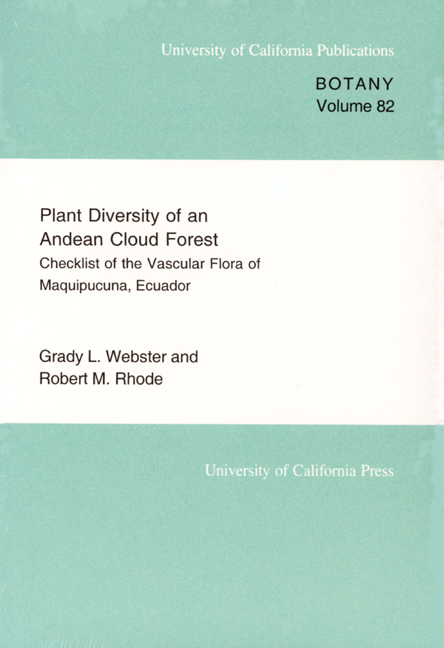 In addition to the checklist of the flora, which enumerates 1,650 species (including 228 species of pteridophytes and over 200 species of orchids), appendices give information on floristic composition of communities, distribution of epiphytes, and elevational ranges of families and genera. The illustrations include a map, landscapes, and characteristic species.